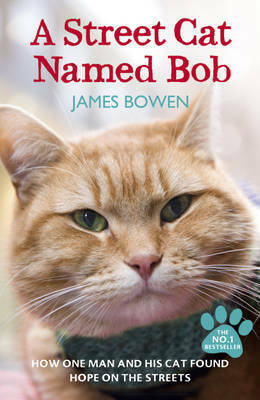 Synopsis: When James Bowen found an injured, ginger street cat curled up in the hallway of his sheltered accommodation, he had no idea just how much his life was about to change. James was living hand to mouth on the streets of London and the last thing he needed was a pet. Let’s just start by saying I adored this book! It’s cute, sweet and heart-warming. The plot…follows Bob and James meeting and getting to know each other, which means it’s told in a very real, day-by-day way. The characters…well maybe I should skip this one as they are both real! This book is kind of an autobiography, so yeah, just going to move on. The writing…okay, this is where I’m going to critisise. Technically, there is nothing wrong with the grammer or sentence structure. And although this book is a little poorly edited, it just adds to the real life feel of the whole book. But if you are used to classic literature (for example), you might find it hard to get into. Overall, though, I just loved it. The writing was honest and heartfelt, and there could have been no better way to go through James’s story feeling close to him, with him at all times. This book needed an autobiography, almost diary style story to help feel connected with both James and Bob, and therefore I’m glad for it. Something I liked…I’m sure a lot of people here would say Bob, but I’m going to say James! Yes, he’s been involved in some pretty horrible situations in his life, and yes, partly due to his decisions. But I completely got it. James felt alone and like he needed certain lifts in his life because in the end, he felt like he had no responsibility. I can’t imagine many things being harder than what he went through, and I admire him so much! Something I disliked…nothing, really. I’m not going to lie, it did take me a while to get used to the writing. But apart from that, all was good. My thoughts…if you love animals, read this book! And if you have a negative view of homeless people, I would also recommend it. Sometimes we don’t understand things until we’ve walked in someone else’s shoes – and that’s how I felt with this book. I now have a completely different view of homeless people, buskers and Big Issue sellers. But not just that, it’s also heartfelt, tender and heartwarming. I loved it! Want to find out more about James and Bob? Well, not only is there going to be a movie, you can also follow them on Twitter here! It is! I think I’d just heard a lot of good things about it so had to follow and get myself a copy haha. That’s awesome! I’ve never met them but then again I’m not in London often at all. Saying that, I have seen videos and Bob is certainly impressive!